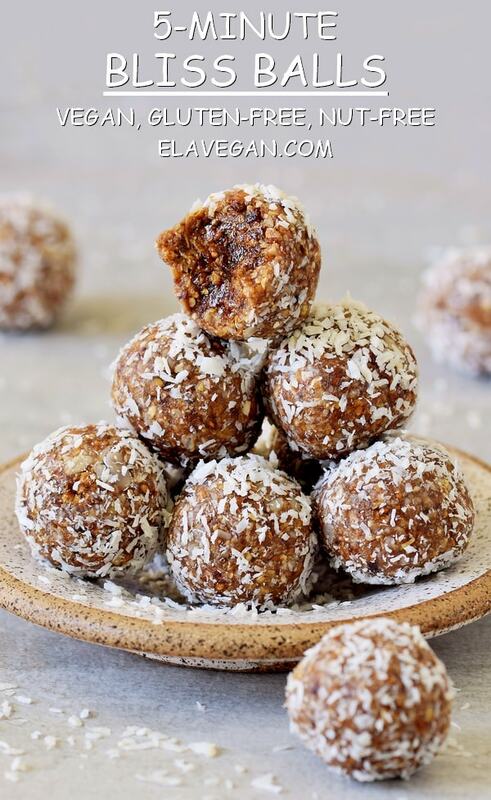 This bliss balls recipe is very easy to make in just 5 minutes! 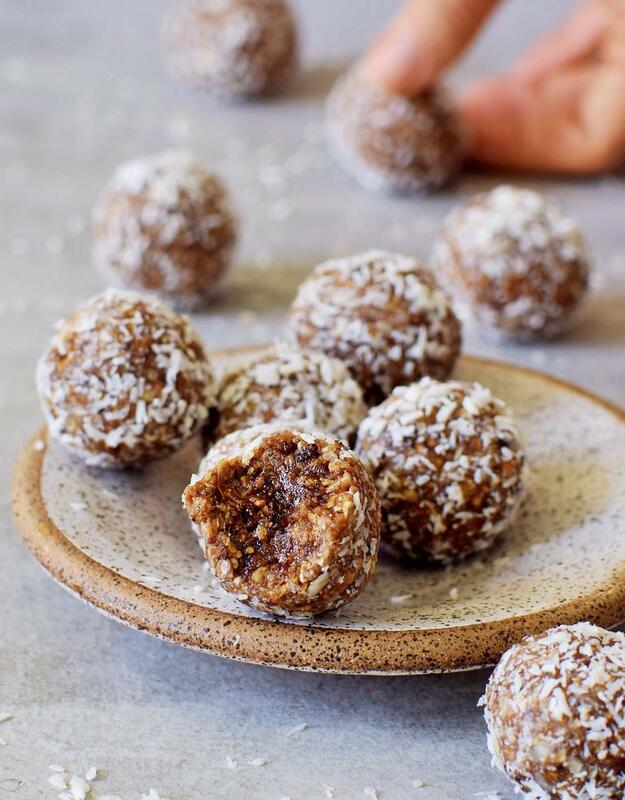 I love to make healthy bliss balls, as they are a great snack and can be taken to work/school or on travels. I also call these bliss balls “power balls” as I feel they deliver instant power when I eat them. They contain only wholesome ingredients, healthy carbs, fats and protein, no processed crap and no refined sugar! 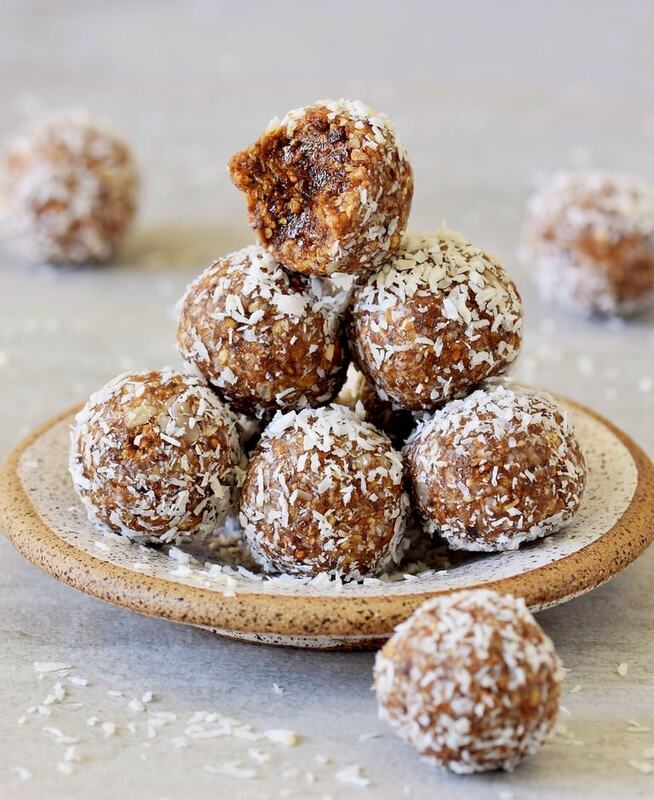 These vegan bliss balls don’t require baking which means the recipe is fully raw. They are furthermore gluten-free and nut-free. I want to live a healthy lifestyle, that’s why I avoid processed food as much as possible and make all of my desserts myself. I have never seen a healthy dessert in a supermarket here, so I make my own cakes, cupcakes, raw cakes, crepes, brownies, pancakes etc. 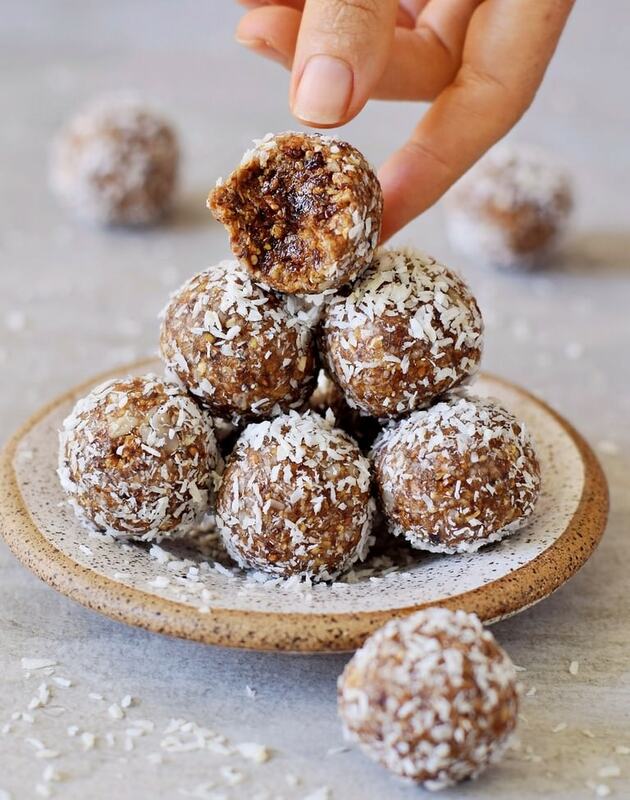 If you are new to making your own desserts and believe that it’s complicated to make a healthy treat, then try my easy bliss balls recipe. 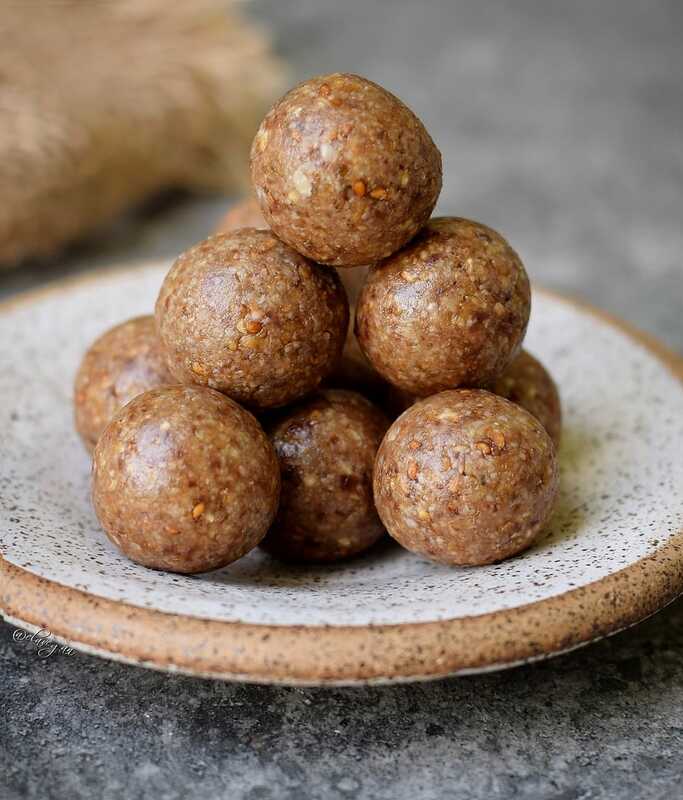 This is without a doubt the easiest recipe on my page, as it contains just 5 ingredients which just have to be processed in a food processor and rolled into balls between your hands. That’s it, you are done in 5 minutes, I am not kidding. Perfect vegan snack for busy moms/families. And I promise your kids will love them! At first, they will look like the balls in the next picture, pure without any coating. You can, of course, make them look fancy and roll them in cocoa powder, matcha powder, maqui berry powder or even melted chocolate. Just imagine to eat delicious chocolate bliss balls, sounds amazing right?! Or what about peanut butter bliss balls? Simply add some peanut butter to the dough and voila (you will need to use more oats if you add peanut butter)! I rolled the vegan bliss balls in shredded unsweetened coconut to make coconut bliss balls because I just love coconut! 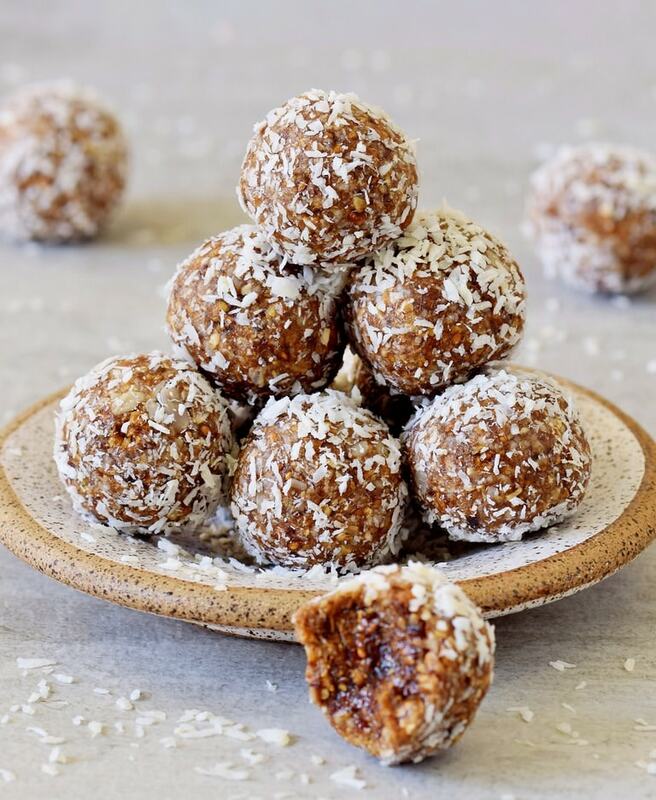 Use Medjool dates to make salted caramel bliss balls! 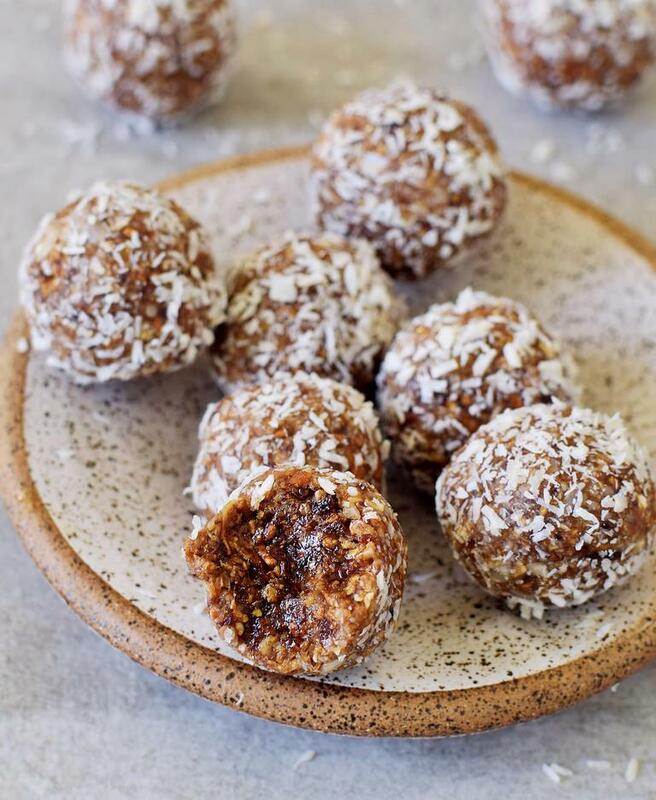 This bliss balls recipe contains only healthy ingredients. Such as dried mulberries which are high in Vitamin C, Iron, and Calcium. I didn’t add nuts but instead, I added sunflower seeds. They contain lots of Vitamin E, Copper, Vitamin B1, B3, B6, Folate, Magnesium, Phosphorus, Selenium, Zinc, and protein. Dates will deliver instant energy as they contain healthy carbs and oats are high in Manganese. One bliss ball contains about 90-100 kcal, just 3-4 g fat and about 3 g of protein (depends on how big you roll the balls). Can you make bliss balls without dates? Absolutely! Simply use any other dried fruit instead, for example, dried figs, dried apricots etc. I have made apricot bliss balls once and loved the result! Can you leave out the mulberries? Yes, you can. The dried mulberries add some sweetness, so you will need to increase the amount of dried fruit but you will also need to add more seeds/nuts. I would recommend to double the amount of dates and sunflower seeds (or nuts of choice) and use the other ingredients as stated in the recipe. How to freeze bliss balls? I often double the recipe and freeze leftovers in zip-lock bags! Let them thaw for 20-30 minutes before you serve them. Make these date balls today! If you recreate my recipe, please leave a comment below and/or tag me in your Instagram or Facebook post with @elavegan and #elavegan so that I can see it! 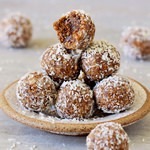 Bliss balls recipe with mulberries, dates, sunflower seeds, and oats. 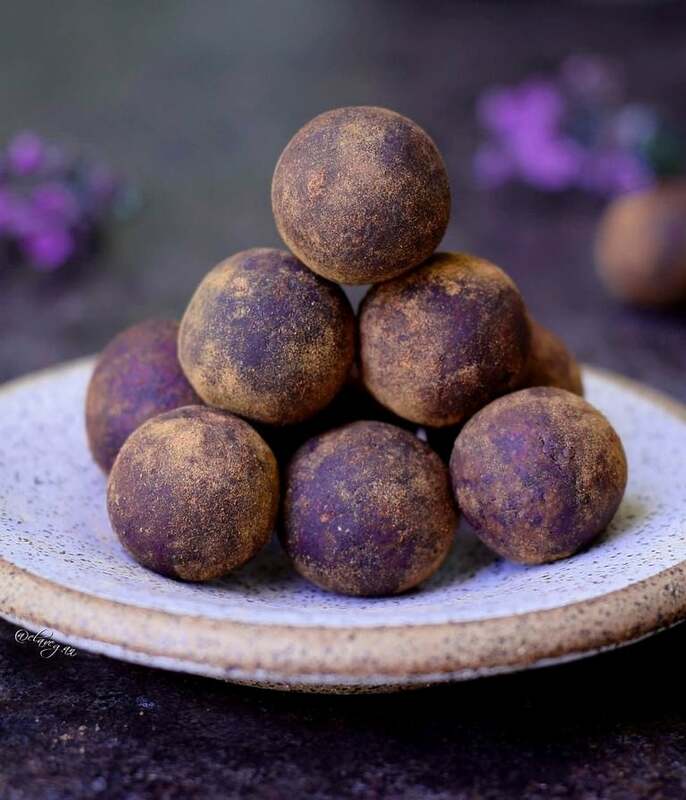 Easy to make vegan, nut-free, and gluten-free raw truffles which can be rolled in desiccated coconut, maqui berry powder or cocoa powder. Process all ingredients except the dates and the vanilla extract in a food processor for about 10-20 seconds. Add the dates and the vanilla extract, blend again until the mixture holds together when you press it between your fingers. If it's too dry add a few more dates. Use about 1 tbsp of the mixture to roll a ball between your hands. Continue until no dough is left (recipe makes about 10 balls). I rolled the balls in desiccated coconut, but you can roll them in cocoa powder, matcha powder, powdered sugar, cinnamon or maqui berry powder. You can use desiccated coconut (shredded unsweetened coconut) or almonds (or any other nuts of choice) instead of sunflower seeds. You can use other dried fruit such as dried figs, dried apricots etc. instead of dates. You can leave out the dried white mulberries and instead double the amount of dates and sunflower seeds. Thank you so much for sharing this easy recipe ! I love the look of these just beautiful , I can not wait to make them ???? These look so yummy Ela! I’ve never used Mulberries in bliss balls before but it sounds delicious! I cannot get over this color Ela, you are making me want to hunt down maqui berry powder stat!! I love bliss balls and all their delicious versatility too, and the mulberries are another fun little berry twist???? Thanks for rhe recipe! Just wondering if we can replace mulberry and small dates with other options? If yes, what will you suggest? Your bliss balls are so round and perfect. And the photography is just beautiful, Ela! I don’t have access to Mulberries in Mauritius. I miss it so much. Love this easy recipe Ela. Hi Ela, Any ideas for what to use as an alternative to oats? I’m grain free. Thanks! I look forward to creating some of these for my family. Thankyou so much for sharing. Just finished doing these … very delicious… thank you for sharing this recipe ???????? Will DEFINITELY try these myself, can’t wait to do so. Your recipes never fail me, such great recipes all the time!! Thank you again, for sharing! These are such a beautiful color, I can’t stop looking at your photos. I’m not sure where to get dried mulberries or maqui powder, but these are truly breathtaking. I was looking for a recipe that called for Mulberries … because they’re high in iron … these look great and I can’t wait to try them. Thanks so much! !